What is an Economic Contraction? An economic contraction is a slowdown of economic activity and stands in direct contrast to economic growth. Economic growth is a continual expansion of the economy and so an economic contraction is the exact opposite, a period when economic activity declines. An economic contraction can have far-reaching social consequences depending on its duration and severity. Slowdowns in economic activity, from time to time, have always been a feature of the economic landscape as part of the business cycle. They are best understood by considering the way economies develop. The economy of any nation grows, when it keeps producing larger and larger amounts of goods and services. This production of goods and services is known as Gross Domestic Product (GDP) and is typically measured on a quarterly and annual basis. The “Gross” indicates that depreciation of capital goods has not been taken into account. Every year, some capital equipment (machinery is a good example) wears out or becomes obsolete. Consequently, part of new production goes to replace the capital equipment that can no longer be used. The “Domestic” refers to production within a country’s borders. Some production facilities are, of course, owned by one country but situated in another. The “Product” is simply the goods and services produced. When there is economic growth, GDP increases. In an economic contraction, GDP falls. Economic contractions occur regularly. They are the low points in a series of ups and downs of economic activity known as “business cycles.” See Figure I below. 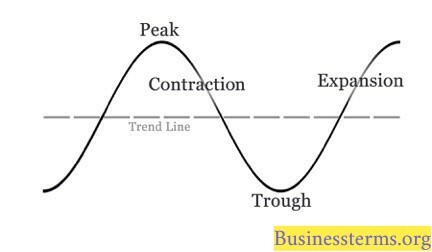 As will be noted, a business cycle has four phases: peak, contraction, trough and expansion. The “trend line” is simply an average of the highs and lows. A peak is the top point of the cycle. At peak, most of the economy’s resources are being utilized and business owners and consumers alike are optimistic about the future. Importantly, the level of employment is high and jobs are available for all who want to work. Indeed, in this phase many businesses may find it difficult to find qualified workers. A contraction is a downturn in economic activity. During this phase, consumer demand falls off and businesses curtail production, for there is no point in producing goods if they won’t sell. Lower sales affect business profitability and cash flow, which may force some enterprises into insolvency. In an effort to stay afloat, many businesses will reduce costs by laying off staff. The resulting fall in employment will further reduce the level of demand, as consumers have less to spend. A trough marks the bottom of the cycle, when the adverse forces in the economy have played out. At this point, businesses will have large amounts of unsold goods, which they are willing to offer at discounted prices, thus the prices of consumer goods will fall. So too will the prices of business equipment and other assets, which will induce investment. As a result, the downward trend is broken and economic activity begins to pick up. The economy then embarks on an expansion: a period of increasing optimism, investment and consumer demand. Why economic activity proceeds in business cycles is an ongoing focus of economic research, with the emphasis on avoiding economic contractions and recessions. In the past, recessions have been triggered by rapid rises in the prices of essential goods, as happened in the 1970s when the price of oil rose sharply. However, contractions in monetary policy (reducing the money supply or raising interest rates) may also lead to recession as may many other factors. Regardless of the cause, an economic contraction affects one of the five main components – consumption, investment, government expenditure, exports, imports – of national income (GDP). Consumption is the expenditure that households and individuals make on most items. It includes practically everything – food, clothes, cars, cinema tickets, masseuse fees, rent – except money spent in constructing new homes, which is regarded as investment. Investment is expenditure by businesses and money spent on building new homes. Government expenditure is spending by the government, which, of course, comes from taxes. And exports and imports are goods and services sold and purchased abroad. Of these, consumption is usually, the most important. For example, in the U.S., consumption expenditure accounts for about two-thirds of GDP. Since consumption is really the spending that everyone does, it depends a great deal on the level of employment. When the economy is doing well, businesses hire and practically everyone who wants to work can find a job. Then the unemployment rate falls (4-5% is considered “full employment”) and since people are earning, they have money to spend. The opposite happens in an economic contraction. If businesses think future prospects do not look good, they will lay off employees. Those who have no jobs will not have money to spend and those who still do will tend to curtail spending. The fall in spending means that business sales go down, which reinforces the view that things are bad, setting up a vicious cycle that can worsen considerably. Since an economic contraction can have devastating social consequences, governments are quick to intervene in an attempt to reverse the cycle. After the onset of the Great Recession (see below), the U.S. government initiated a number of measures to stimulate the economy and return it to a path of growth. In 2008, Congress passed the Economic Stimulus Act and in 2009, the American Recovery and Reinvestment Act. In addition, the Federal Reserve reduced the federal funds rate, which is the rate that banks lend reserves to each other, in an effort to get banks to provide credit to households and businesses. An economic contraction may last long enough to be labeled a recession. One of the worst – the Great Recession – began in December 2007 and lasted until June 2009, but there have been others. There is no single definition of what a recession is. Many commentators in the financial world will call a recession when there has been a decline in economic activity, as measured by GDP, for two consecutive quarters (6 months). However, professional economists prefer a broader definition. For instance, the National Bureau of Economic Research (NBER), which tracks U.S. economic activity, considers not only GDP, but also employment, income, sales and other measures. The Great Recession has been the most recent economic contraction. GDP fell 4.3 percent as it ran its course and the hardship it caused affected millions. The unemployment rate, which was 5 percent before it began, doubled to 10 percent in October 2009, even though, by that time, the economy had begun to grow again. The Great Recession has been ascribed to a variety of factors, chief among them a savings glut in Asia, the collapse of the housing market, and a contraction in credit. Either of these could have been instrumental in triggering its onset. An economic contraction may be severe enough to turn into an economic depression, like the worldwide economic contraction that occurred in the 1930s. The Great Depression, as it came to be known, started in August 1929 and lasted until March 1933, i.e., for three years and seven months. Economic contractions are serious matter but the Federal Reserve System is still able to joke about them. The following appears on the website of the Federal Reserve Bank of San Francisco. Q. What is the difference between a recession and a depression? A. When your neighbor loses their job, it’s a recession. When you lose your job, that’s a depression! 1. When did the greatest economic contraction in the U.S. occur? A. The greatest economic contraction in the U.S. occurred on Monday, October 19 1987, when stock markets fell by over 20 percent. B. The greatest economic contraction in the U.S. occurred in the 1930s, from August 1929 to March 1933. C. The greatest economic contraction in the U.S. took place in the early 21st century. It ran from December 2007 until June 2009. 2. What is the difference between a recession and a depression? A. There is no difference. In the U.S., an economic contraction is called a recession; in Europe, it is referred to as a depression. B. A recession is an economic slowdown, where no jobs are lost. A depression is an economic slowdown where jobs are lost. C. A recession is an economic contraction that does not slow economic activity substantially, while a depression is a severe economic contraction, i.e., one that lasts for longer and reduces employment of economic resources (including labor) substantially. 3. In an economic contraction, does consumer spending rise or fall? A. Consumer spending falls, since the work force is reduced and those with jobs become more cautious about spending. B. It could rise or fall, depending on the level of savings consumers have. C. Consumer spending rises, as consumers attempt to reverse the contraction.